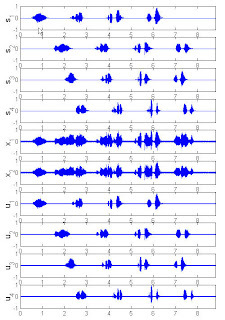 Changkyu Choi, "Real-Time Binaural Blind Source Separation," in proceedings of International Conference on Independent Component Analysis and Blind Signal Separation, April 1-4, 2003, Nara, JAPAN. Errata: The M must be changed to L/2 in equations (5), (9), and (10). [Four Original Source, Two Noisy Mixtures, and Four Denoised and Separated Sources.